Movie producer and Obama bundler Harvey Weinstein and fashion designer Georgina Chapman (R) arrive for a State Dinner in honor of British Prime Minister David Cameron at the White House on March 14, 2012. Weinstein has raised more than $500,000 for the president's campaign. Alongside notable figures from Hollywood to Washington at the State Dinner for British Prime Minister David Cameron on Wednesday night, there were also 47 so-called bundlers, or mega-fundraisers, for President Barack Obama’s reelection campaign that made the exclusive guest list. A bundler is a fundraiser who bundles donations from others on behalf of the campaign. Combined, this group of fundraisers has raised at least $10 million for the president – and likely much, much more. The Obama campaign provides a list of these “volunteer fundraisers” on its website, but rather than reveal exactly how much they have raised, they simply place the donors into tiers. Thirteen of the dinner attendees raised more than a half a million dollars for the president, 24 raised between $200,000 and $500,000, eight raised between $100,000 and $200,000 and three between $50,000 and $100,000. US President Barack Obama and First Lady Michelle Obama pose with British Prime Minister David Cameron and his wife Samantha Cameron at the Grand Staircase of the White House March 14, 2012. Concluding the official visit of British Prime Minister David Cameron’s visit to Washington D.C., the president and first lady hosted Cameron and his wife at a State Dinner on the South Lawn of the White House Wednesday evening. As yet another signifier of the importance of the so-called special relationship between the U.S. and Great Britain, the White House opted for a full State Dinner despite the fact that the dinner’s honoree is the head of the British government and not its head of state. During the toasts, both leaders mixed humor with sincerity in expressing the importance of their friendship and the close relationship between the nations they lead. To lighten the mood, Obama read some press accounts of his visit to London in 2011, during which he and Cameron exchanged beers from their native countries, hosted a barbeque for service members and played table tennis with local students. Guess who is coming to dinner? The State Dinner. 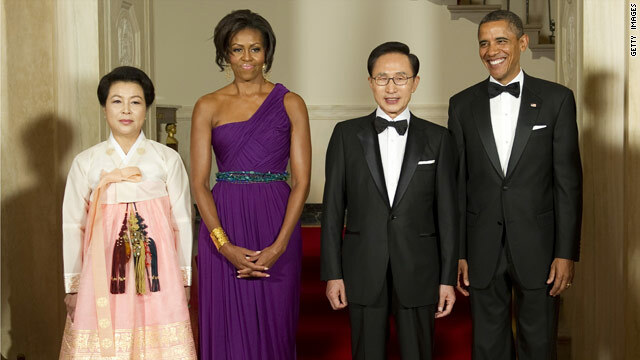 The President and Mrs. Obama invited the following as guests to tonight's State Dinner. 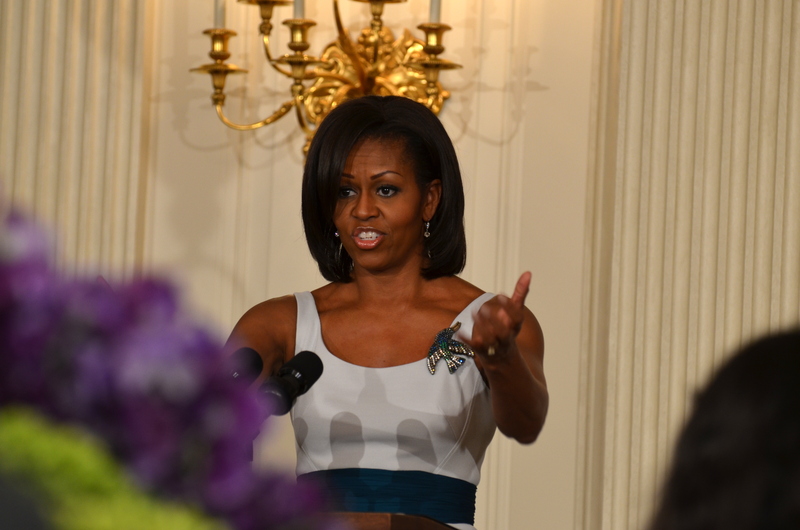 Mrs. Obama gave a short preview of tonight's State Dinner to a group of local students this afternoon in the State Dining Room. Explaining the intricate dance required to serve dinner for 150 guests, the first lady described the kitchen to the audience. "The White House is a big place, but the kitchen is really teeny. You wouldn't believe it - it's a little bitty kitchen, so they have to really man the engines to make it happen," Mrs. Obama explained. 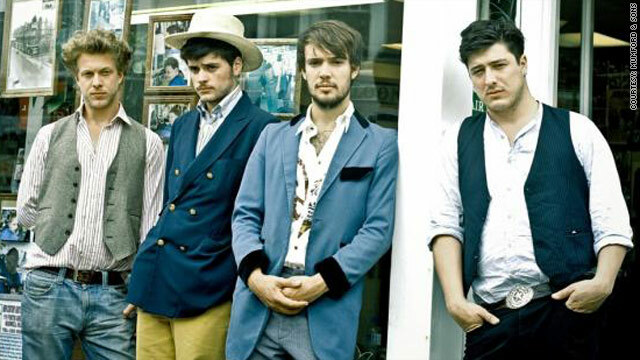 The White House will host a State Dinner Performance on the South Lawn following the dinner, featuring performances by Mumford and Sons and selections by John Legend. The theme of the décor for the United Kingdom State Dinner is “America’s Backyard.” Traditionally, America’s backyards are places of gathering and entertaining close friends and family. 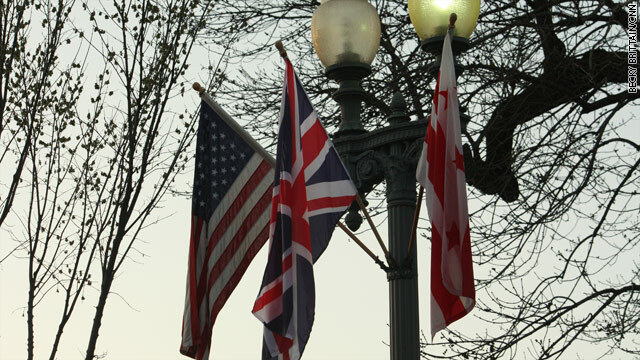 The special relationship between the United States and the United Kingdom makes this “backyard” celebration a quintessentially American event. 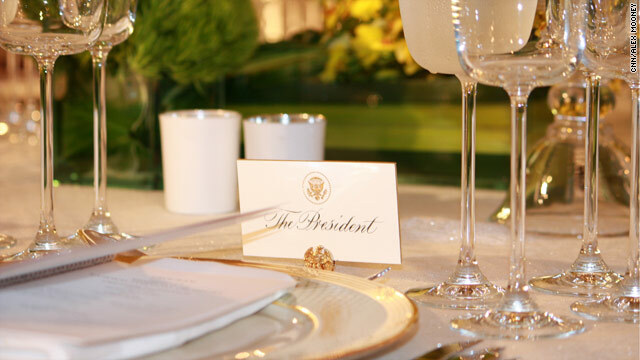 Located in a tent on the South Lawn of the White House, the State Dinner encouraged a celebration of American gardens. The grounds of the White House are in clear view through the 150 foot-wide glass wall of the dinner tent. In honor of our guests, the beauty of countryside English gardens is also incorporated into the design by Rafanelli Events. Planters and centerpieces used at the dinner are intended to emulate nature and the flowing “landscape gardens” that are common in England. The English have also become widely known for their flower borders, with perennials, annuals, and sometimes shrubs combining to form masses of color. 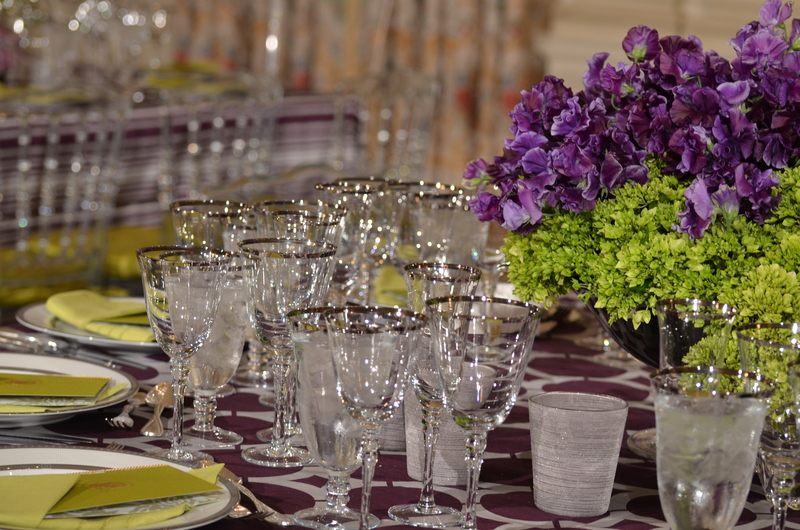 The design of the tent embraces this passion for color in the floral arrangements, lighting, amethyst linens and matching carpet. Roses—the national flower of both countries—play a major role in the floral arrangements. Bison – It's what's for dinner! The President and Mrs. Obama will host Prime Minister David Cameron and Mrs. Cameron for a State Dinner this evening. 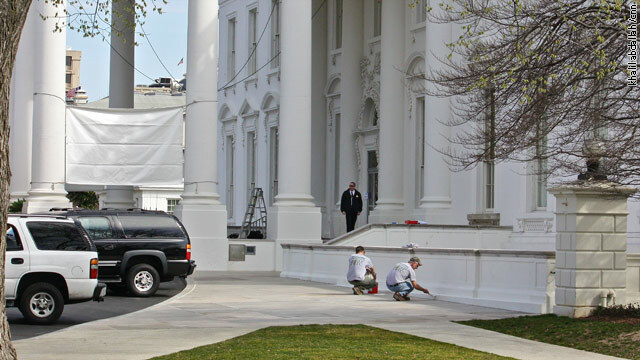 The State Dinner will be held in a tent on the South Lawn of the White House. White House Executive Chef Cris Comerford and White House Executive Pastry Chef William Yosses have carefully constructed the evening’s menu using local ingredients, including produce grown in the White House Kitchen Garden. A Winter Harvest Dinner: The United Kingdom State Dinner takes its inspiration from the Kitchen Garden’s late winter harvest and some early spring greens, which chefs harvested the day before the dinner. The White House Kitchen Garden uses hoop houses—simple metal frames covered by plastic tarps—to grow produce throughout the winter months. During the day, the plastic traps heat from the sun, and at night that heat protects plants from freezing temperatures. Using this method, produce thrives in the White House Kitchen Garden throughout the year.